A few more reflections from the road in the Philippines | Walk with us! 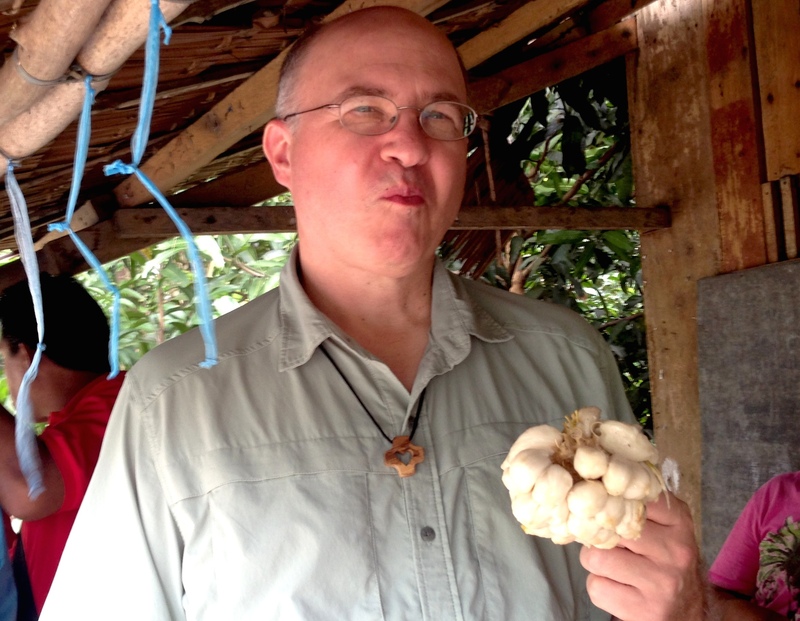 “I’ve been trying a lot of food I’ve never had before!” said Fr. Steve. We aren’t sure if this face means that he likes his latest Philippine meal or? I’ve seen and experienced so much in such a short time. I have much to think about and process and so many questions about a culture so new to me. Fr. Aloisio and Fr. Khoa served as today’s tour guides and gave me background on how our parish projects and formation programs developed and changed in the 25 years since the first SCJ foundations here. Fr. Al said that when he first arrived 20 some years ago he was ready to write a book about all his observations. A year later as he began to learn the nuanced complexities which are true of any culture, he wasn’t sure he could write even a page. I can identify with that already. 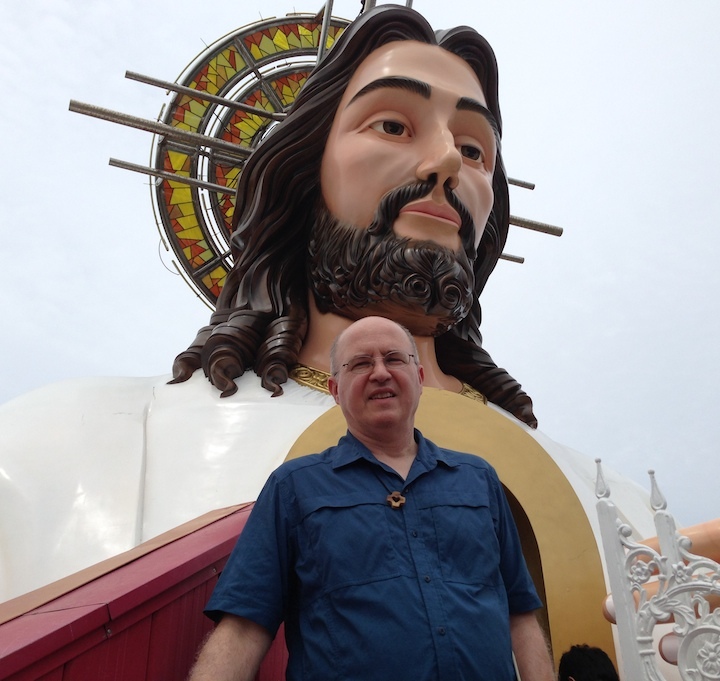 The Divine Mercy Prayer and devotion has caught on with many Filipinos, and they suggested I visit the shrine. The picture I had in my mind was completely blown away by the size and scope of the place of pilgrimage. The statue of the Sacred Heart of Jesus was as tall as a ten story building, his face alone bigger than me. We climbed up a staircase built upon the rays shining forth from the heart, and found a heart shaped chapel where people knelt in prayer. Signs encouraged people to “approach the Heart of Jesus” in prayer. At the foot of the statue are beautiful gardens and lawn that are use for gathering spaces for outdoor prayer. Behind the statue is a large church, with seating for perhaps a thousand. The shrine was built by lay people, and is run in conjunction with the diocese and a group of priests from the Marion Helpers community. We dropped by the rectory where Fr. Valerian told of his work hearing confessions, saying mass and providing programs for visitors. We had a lively discussion about “religious tourism.” The goal of any such devotion or shrine is to help people have a lively, daily faith and commitment to their community rather than be just an occasional filling station that makes people feel good for a short while. I suppose that’s the challenge in all of our parishes and other ministries. In town we visited two contrasting shopping areas. The air conditioned mall could have been in most any Milwaukee suburb. It’s one of the few public places with (as they call it) “air con” and many townspeople just come in to cool off, window shop ands people watch. Then we stopped at the public marketplace, a vast concrete warehouse with rows upon rows of farmers selling fresh fruits, vegetables and dried fish of all shapes and sizes. We arrived home as the students were finishing work period. 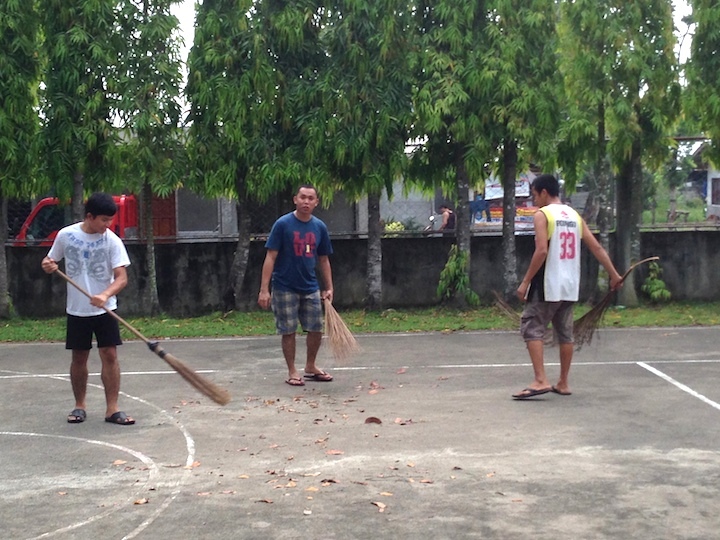 I saw then sweeping off the basketball court with brooms made from coconut leaves. This Hoosier was tickled to find that basketball is also king of the sports in the Philippines. I picked up a ball and started shooting around with one of the guys. You can have a great conversation between shots and the students were grinning to watch the old man nail a few jumpers. I met a group of young women visiting the compound for a Dehonian Youth Missionaries gathering. The Philippine Province has tried to spread Leo John Dehon’s message to a wide audience, and I’m encouraged to see it taking root among the laity. After supper we visited the SCJ parish in the nearby Aluba neighborhood. The formation house is within its boundaries and in makes a good training ground for seminarians to do apostolic work or Deacons to intern. Fr. John spoke of the challenges of having sections of the parish both wealthy and poor, and trying to bring the two together as a faith community. 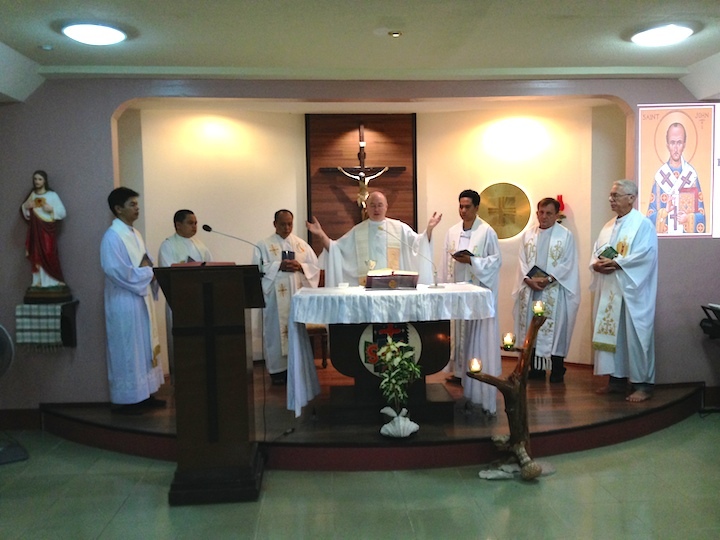 Yesterday I presided at morning mass with the students in Cagayan. We took a couple of group pictures, then I felt like a rock star or visiting celebrity as they lined up for individual pictures before I bid them farewell. Fr. Arthur (Totong) is the district treasurer, vocation director, and like most every religious, wears many other hats as well. He was born and raised in the area, and proved an entertaining and informative tour guide as we wound our way five hours through costal villages and mountain huts, rice paddies and colorful villages in the Zambuanga del Sur region. Some years ago there were clashes with militants in the area, but recently it has been calm. We did pass a couple of police checkpoints as they try to keep the area safe. Totong spoke of his hopes for the SCJ community as it grows and matures in the Philippines. He described a Filipino value of wanting to show generosity and give back, and hopes one day they will provide missionaries to areas of the world and congregation in need. I was told the novitiate in Locuban is one of the most beautiful spots in the congregation. It is build on the side of a mountain, and the chapel overlooks rolling mountains and lush green valleys. With mist rising over the hills I felt like I was in the Blue Ridge or Great Smokey mountains until I noticed that most of the trees are palms. The setting is remote and so very calm and quiet. Once the sun set the view out chapel windows looked like solid black paint in the absence of any light. 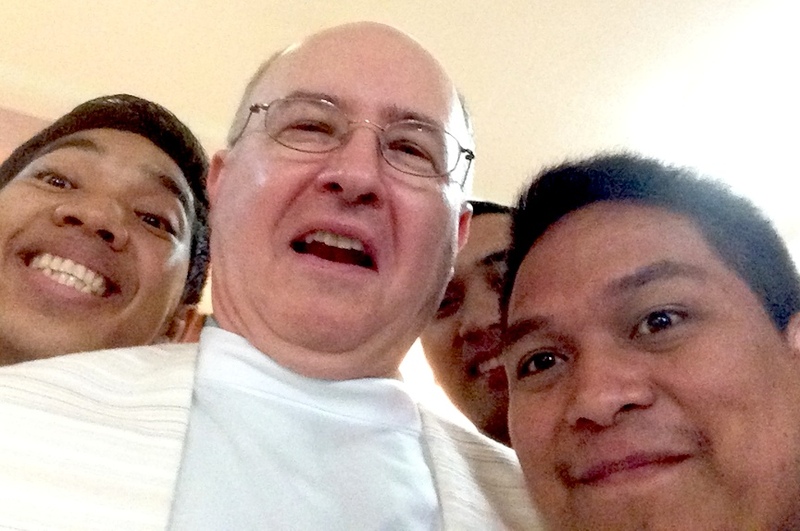 Three SCJ priests and a deacon serve the Dumalinao community about 15 minutes away. They are responsible for 92 chapels. Some are accessible only by foot and it is a special occasion whenever they are able to say mass in those communities. They put a lot of emphasis on training local catechists and lay leaders who can pass on the faith and keep it vibrant. Fr. Lukas, originally from Indonesia, studied ESL in Hales Corners in 1996-97 before being missioned to the Philippines. He asked about many of our guys he fondly appreciates, and we reminisced about some who have since gone on to their eternal reward. The SCJs invited me to a favorite local restaurant to sample yet more local specialties. The place also featured Karaoke, which is another Filipino passion. They called for the American to sing something so with two beautiful backup singers with real talent and the church organist from the cathedral on the keyboard for support, I belted out “Let it Be.” We left with smiles and happy memories. This morning I had mass with the novices, and after communion shared a little about myself and our province. They had lots of follow up questions at breakfast. Then they went off to take care of morning chores, feeding the chickens, watering the garden, gathering eggs and the like. They raise goats and cows as well. Fr. Totong drove us further west to visit our parish in Kumalarang. We were joined by Fr. Yohanas from novitiate, and Juliette, a college-aged woman who has helped work in the various churches since she was nine. I asked her what she knew and thought of Fr. Dehon. She is so grateful the SCJs go to where people are and ask not just for their help, but for their opinion and input. In Kumalarang the SCJs again serve many remote and hard to access chapels in the mountains. The pastoral team relies on some 120 catechists, and other groups of lay leaders and councils to meet the ongoing needs of the people. They have a simple guest house where those coming for monthly trainings can stay overnight due to the complications of travel in the area. A few couples were arriving to take part in a marriage encounter type program. The chapels and church halls are sturdy yet simple, with open air sides to cope with the tropical heat.